Arrange the arugula on a plate or serving platter. Place the watermelon and feta chunks throughout your bed of arugula. Drizzle with balsamic vinegar and salt and pepper to taste. This recipe was inspired by A Thought For Food. February marks the last bit of winter. In Ayurveda it is "kapha" season, which means that our digestion and our bodies might feel sluggish. It's an important time to start to boost our metabolism of fat in preparation for spring cleansing. So in order to assist our gall bladders and livers rev up their fat-busting super powers, we should favor natural cleansers such as vinegar, lemons, beets, kale, and beans. Beware of too much dairy this time of year, as it can keep our systems slow and sludgy. If you're going to partake, then try to include goat dairy, as it is generally easier on the digestion than most cow dairy. In terms of seasonal eats, there's not much growing outside in February, so it's nice to have stocked up on some canned or pickled items (I just learned how to make pickled beets in November...Thanks Tamlin!). And folks who are fortunate enough to have a greenhouse or cold frame might have some greens growing. So thus was born this warm pickled beet salad with arugula and goat feta. Feel free to add whatever kinds of herbs to your vinaigrette that sound tasty. I personally liked the basil/mint combo, but get creative and enjoy! In a small bowl whisk together olive oil, vinegar, garlic, allspice, salt and pepper to taste, the mint, the basil. Then dip a toothpick in the doTERRA basil oil and stir it into the mixture. Heat a medium saute pan over medium heat, add the ghee, and the onions. Allow the onions to brown, then add the pickled beets. Saute them together for a few minutes until sufficiently warmed. Add a bit of the dressing mixture into the pan to coat the beets and onions. Toss the arugula in remaining dressing. Put it into serving bowls (2 for a meal-sized salad, 4 for an app-sized salad), then adorn each bowl with a bit of the beet onion mixture. Crumble some goat feta atop each one. Serve and enjoy! Basil Essential Oil: Basil has powerful anti-infectious, antibacterial, anti-inflammatory, antispasmodic, antioxidant, and antiviral properties. It can be used to boost alertness and concentration, ease anxiety, nervous depression, headaches, mental fatigue, and insomnia. See here to learn more about doTerra essential oils. Autumn is one of my favorite times of year because a huge variety of produce is in season. I'm happy to report that the veggies in this salad were grown locally. I'd say they weren't harmed in the making of this salad, but I'd be lying. They were all gobbled up (with love and appreciation, of course!). What other stackables can you imagine? Squash? Peppers? Eggplant skyscrapers? Other potential items to crumble over the top: bacon...maybe I'll just leave it at that. (Apologies, vegans...a little chopped avocado would be delicious too...) Bon appétit! Method: Mix dressing ingredients and set aside. Skin and slice the beets to match the width of your apple slices. Toss the greens in the dressing in a mixing bowl. Sprinkle with nuts and cheese and drizzle with balsamic glaze. Autumn is the perfect time for "warm" salads. Toss some greens in a pan with vinaigrette, top with yummy fruits, veggies, nuts, or cheese, and you've got your self a real meal! Eating out of a can is not my forte. However, when the moment calls for an instant snack, sometimes a can of beans is a lifesaver. With this recipe, I just scavenged leftovers from the fridge, added a can of garbanzo beans, a huge dollop of pesto, and rinsed a few cabbage leaves. Presto change-o, there was lunch. Other potential additions: cucumber, chopped red onion, Greek olives, fresh or sun dried tomatoes, feta cheese, avocado, or even hunks of leftover fish or chicken. Perhaps a few more herbs like flat leaf parsley or cilantro would be nice. No wrong way to make a wrap! Enjoy. Empty garbanzo beans into large mixing bowl. Chop the olives and peppers and add to the bowl. Add the rest of the ingredients and mix until well-combined. Scoop a dollop into your leaf of choice. Serve and enjoy! Garbanzo Beans: Also known as "chickpeas," these beans are particularly high in insoluble fiber, which means you have a squeaky clean colon and feel fuller for longer when eating these legumes. They are also extremely high in lots of nutrients such as manganese, folate, and tryptophan. They are a great source of plant-based protein. If you find legumes make you gassy, try pre-soaking them for easier digestion. See here for more health benefits and nutritional information. Many suggest that soaking nuts (and grains, legumes, and seeds) before consuming them enhances their nutritional quality. Olives: The antioxidant and anti-inflammatory properties of olives abound, making them ideal cancer fighting food. Olives are also rich in iron, fiber, copper, and monounsaturated (read "healthy") fats. See here for more health benefits and nutritional information. I love pesto. So much that I often snag a spoonful from the jar all by itself. But when I feel like not being a barbarian, and actually putting a full three minutes into lunch preparation, pesto of any variety (cilantro, basil, or arugula...whatever you have on hand) is quite a treat when mixed in with veggies and beans. If you're on the Paleo diet, then you can replace the beans with diced chicken or hard boiled egg for protein. It works with just about any type of grilled or sauteéd veggie you have on hand. What's your favorite combo? Bon appétit! Stir all ingredients in a bowl. This recipe was inspired by the N.Y. Times. Anyway, may you enjoy this salad, and your myriad garden-fresh dishes! 1. Combine the arugula, carrots, walnuts, and tarragon (and optional cheese) in a salad bowl. 2. In a small glass jar with a lid, combine all the dressing ingredients. Secure the lid and shake to combine. 3. Shortly before serving, toss the salad with the dressing. *Advance preparation: You can combine the salad ingredients several hours before serving and refrigerate in a covered bowl. The dressing will also hold for several hours, in or out of the refrigerator. Slathered on bread, tomatoes, or to dress a salad, this pesto is tops! Combine the garlic (or garlic powder), basil, and pecans in a food processor. Pulse several times to roughly chop the mixture. Add nutritional yeast (or cheese) and pulse again until ingredients are a course and sandy texture. Put mixture into a bowl and add the drop of basil essential oil and the olive oil. Mix until well-blended. Put a hefty spoonful over noodles, zuccini strips, slather on tomatoes with mozarella, or add a bit more olive oil and dress a salad. There's no wrong way to eat this pesto. *Note: This also freezes will in ice cube containers or mini-tupperwares. Delicious in the middle of winter when there's not a vegetable in sight! 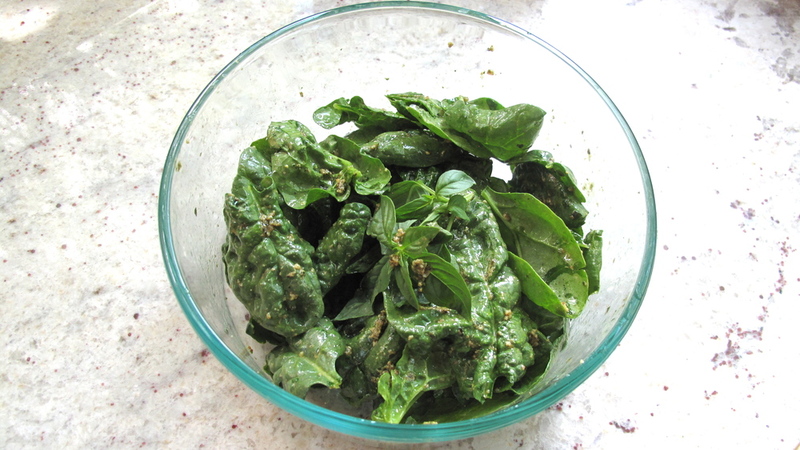 Add a couple tablespoons of olive oil to a tablespoon of pesto and you've got a delicious salad dressing!